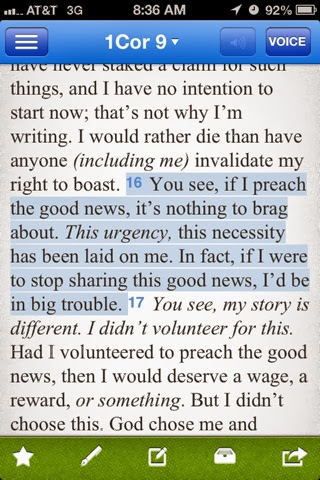 You see, if I preach the good news, it’s nothing to brag about. This urgency, this necessity has been laid on me. In fact, if I were to stop sharing this good news, I’d be in big trouble. 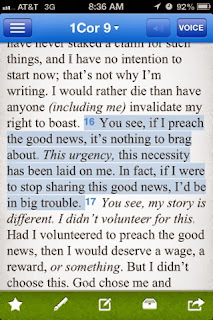 This Scripture had been on my mind because I feel that urgency to share God's word and love. Not a moment goes by in my day when my thoughts don't turn to The Lord. I realize the responsibility of my calling. Social media has increased the reach of my work for God. I find myself compelled to share Scripture, minister to those who need hope in illness and more than anything: I share how God really does want us to know His heart. It no longer matters to me that others think of me as that crazy Jesus lover. But it was uncomfortable becoming the person God made me to be. I was forced out of my comfort zone. I no longer fit in any of my circles. But I am compelled by a Greater Force to never be comfortable again.